Clean and protect in a single step with Ultima Waterless Wash Plus Concentrate! 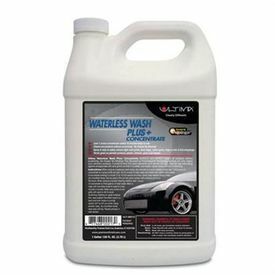 Ultima Waterless Wash Plus+ Concentrate is a hyper-concentrate that can be used to make the Ultima Waterless Wash Plus+ spray wash formula or as a no rinse car wash solution in bucket. Just 1/2 oz. makes 22 oz. of Ready-to-Use Spray Wash and just 1 oz. makes 3 gallons of No Rinse Car Wash Solution. Ultima Waterless Wash Plus+ will not only meet your expectations, it will exceed them in both cleaning ability and gloss enhancement! .This Boosted by Polycharger' formula not only cleans your vehicle's surfaces, it protects from the harsh elements and harmful UV rays. Get a superb slick and glossy surface which is unmatched!